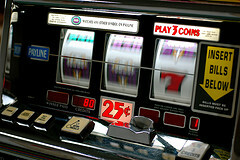 Don’t gamble on employee engagement? When work becomes a mindless addiction, employee engagement loses the power to enrich the person working. I was at the casino in Halifax Nova Scotia this past weekend. It was amazing to walk around the casino and see people so engaged in gambling. They can sit at tables or in front of slot machines for endless hours. And we all know this is going on in thousands of casinos around the world. You don’t have to be a keen observer to notice that so few of the gamblers are happy or enjoying themselves, unless they win big. Some of this demonstrates the addicting power of random intermittent reinforcement. I know some workplaces would love to have people show up and sit at a machine for hours at a time pushing buttons and monitoring the screen. The employer wouldn’t even have to pay the person, the person would pay them! Don’t gamble with your work. What I mean is, enjoy work and don’t let it become a mindless addiction. You might be working all the time but if work is not a source of pleasure or satisfaction I don’t believe you are truly engaged in what you are doing. I say, to heck with letting the chips fall where they may — make a conscious deliberate craft of staying engaged with your work. When we are fully engaged at work we gladly chip in and that “chipping in” is a source of contribution to others, our organization, and a source of satisfaction for us. JACKPOT!